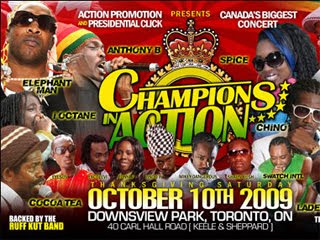 iDancehallReggae.com::Caribbean Lifestyle Media::: Just In: Champions in Action Cancelled? Just In: Champions in Action Cancelled? Just In- We received information from a reliable source that Champion in Actions was canceled from pressure from Gay Rights organization. Caribbean Lifestyle Media followed up with concert promoters Action Promotions to confirm cancellation, we did not received confirmation via phone or email that event was canceled. The event is still being advertise as happening. We will keep you updated as this unfolds.